Hot! hot! This pair looks like a bunch of very ripe chilies waiting to be plucked. 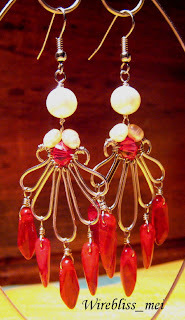 This pair is a combination of pearls (top), 6mm bicone swarovski crystal (center) and red glass beads (bottom). 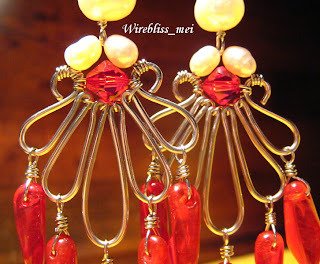 The length from top to bottom is about 8mm. I love the color but when come to put them on, I think its too hot for my taste.